Danish merchant and author; born in Fredericia, Jutland, Oct. 12, 1778; died in Copenhagen Oct. 1, 1859. On the death of his father, Ree succeeded to the management of an important business which had been established in Fredericia by the former. He, however, found time also for the study of Jewish philosophy and literature, the itinerant teacher Eleazar Lisser being his instructor. As a merchant Hartvig Ree was very successful, and he became one of the wealthiest men in Jutland. He engaged in shipbroking, in the manufacture of beet-sugar and cocoa, and in the clothing industry. 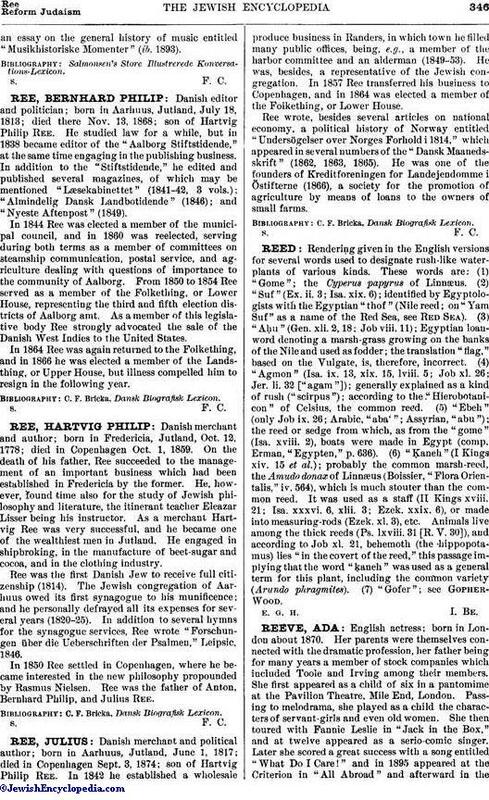 Ree was the first Danish Jew to receive full citizenship (1814). The Jewish congregation of Aarhuus owed its first synagogue to his munificence; and he personally defrayed all its expenses for several years (1820-25). In addition to several hymns for the synagogue services, Ree wrote "Forschungen über die Ueberschriften der Psalmen," Leipsic, 1846. In 1850 Ree settled in Copenhagen, where he became interested in the new philosophy propounded by Rasmus Nielsen. Ree was the father of Anton, Bernhard Philip, and Julius Ree.